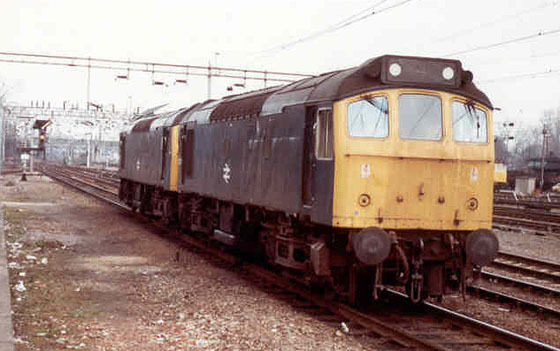 Photograph courtesy Gary Thornton 25150 & 25158 Northampton March 23rd 1982. The seventeen year eight month career of D7500/25150 included allocations to London Midland, Eastern & Scottish Region depots. 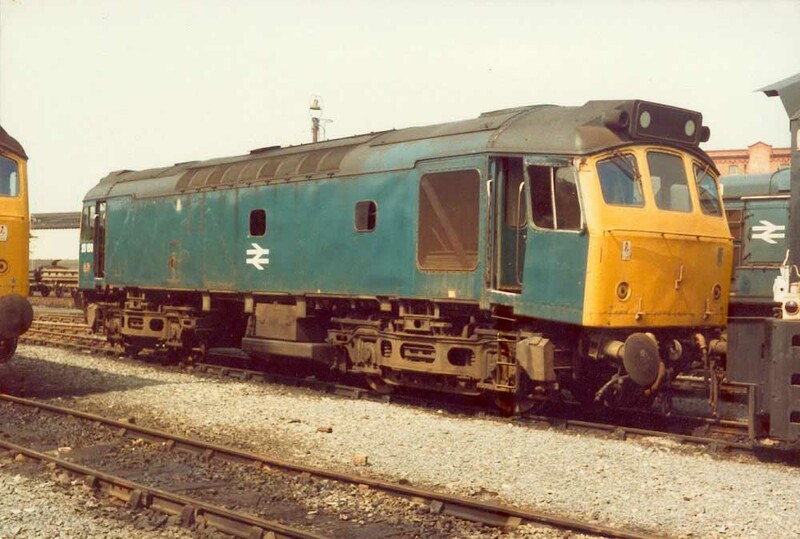 On June 6th 1982 25150 suffered collision damage near Leicester, it was moved to Derby Works on June 10th 1982 for evaluation, following which it was withdrawn on June 13th 1982. 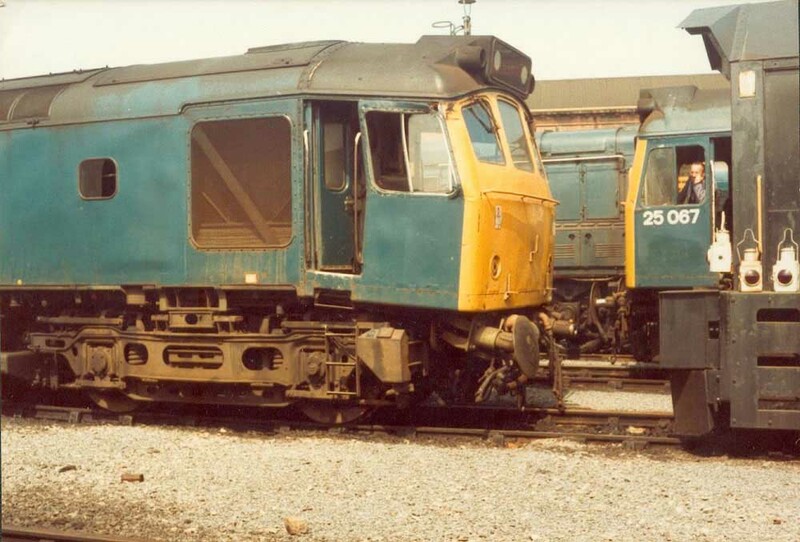 25150 was moved to Swindon Works on February 5th 1985 and scrapped there by the middle of June 1985. Noted Derby Works September 1969 to February 1970 (collision repairs). Noted Glasgow Works November 1972. D7500 was new to Toton at the beginning of October. 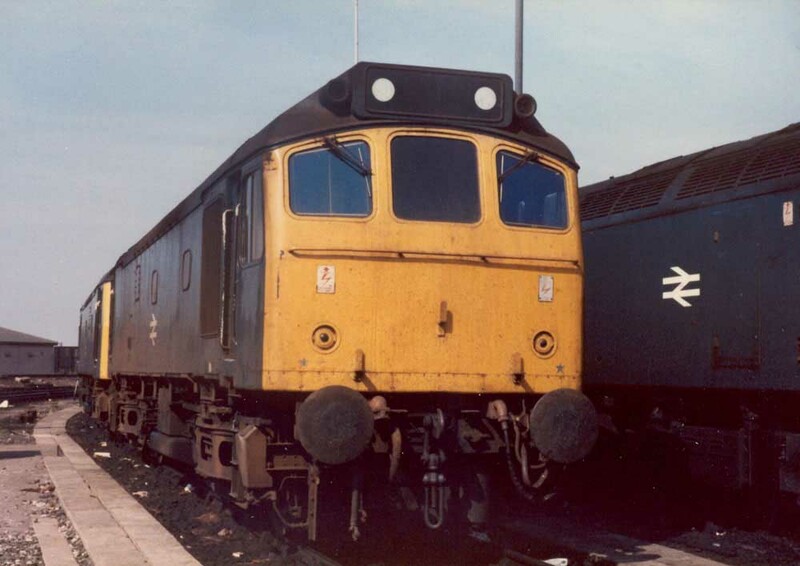 The orders for the Derby Type 2s (later Class 24/25) had grown so much that the original number series allocated to them (D5000 - D5299) had been filled so they jumped to the the D7500 series. During December D7500 transferred to Burton (16F) for a very short period. On June 11th the 08.36 Nottingham - Llandudno Town and the return Llandudno Town - Nottingham were worked by 7500 & 5291. On June 18th 7500 was noted at Derby Works with collision damage to the No.2 cab front. The bufferbeam was bent downwards with the bottom half of the cabfront pushed inwards. The locomotive still retained the original location for the engine exhaust. The repair estimate for the damage was £14,000. The damaged locomotive was previously noted at Kirby shed. On July 26th the summer dated roundtrip Nottingham - Llandudno Town was worked by 7500 & 7529. Condition September: two-tone green livery with full yellow ends, no blanking plates, hand/footholds plated over, engine exhaust located above engine room, straight sided sandboxes, three-rung bogie mounted footsteps, modification to No.2 cab driver's side roof - large ventilation grille added (size is width of the cab door and about twelve inches high). On January 7th the 15.45 Euston - Manchester was stopped south of Rugby with the electric locomotive E3046 well and truly on fire. Delays were incurred to many WCML services. During the evening 7500 was noted at the scene with a maintenance train. After four years on the Nottingham Division (D16), 7500 moved to Haymarket, the first of its two transfers to the Scottish Region. After eight months allocated to Haymarket, 7500 transferred to Tinsley during May, spending the next two years here. 7500 & 7558 were noted on unidentifed passenger working northbound from Sheffield on July 14th. Photograph courtesy Danny Preston, collection Neil Johnson. A fine view of 25150 on an engineers train at Beighton on July 21st 1974. It was on an engineers/ballast working that 25150 would come to grief in June 1982. The 09.20 Manchester Piccadilly - Yarmouth to Lincoln Central and the return 09.30 Yarmouth - Manchester Piccadilly from Lincoln Central were worked by 25150 & 25194 on September 6th. July 29th was probably a typical day at Nuneaton, being noted were returning empty ballast workings with 25150 from Beighton Junction, 25046 from Bordesley Junction and 25116 from Lenton, with two Class 31 hauled workings from the southern end of the Eastern Region. The 09.20 Manchester Piccadilly - Yarmouth to Lincoln Central and the return 09.15 Yarmouth - Manchester Piccadilly from Lincoln Central were worked by 25150 & 25147 on August 21st. A week later (29th or perhaps 28th) the 23.40 Liverpool - York was worked by 25150. A Derby - Skegness round trip was worked by 25150 & 25280 on July 5th. Almost two weeks later on July 17th the 08.45 Birmingham New Street - Barmouth and the 17.30 Barmouth - Birmingham New Street were worked by 25150 & 25156. The 08.45 Birmingham New Street - Barmouth and the 17.45 Barmouth - Euston to Wolverhampton were worked by 25150 & 25263 on June 11th. On July 28th the 12.32 Skegness - Leicester was worked forward from Nottingham by 25150 & 25167 having replaced 20006 & 20030. A week later on August 4th the 10.10 Euston - Aberystwyth from Birmingham New Street and the 16.10 Aberystwyth - Shrewsbury were worked by 25150 & 25040. The last transfer for 25150 took place during January, moving from Bescot to Longsight. 25150 was active on the North Wales mainline on July 5th working the 09.42 Llandudno Town - Manchester Victoria, the 14.40 Manchester Victoria - Llandudno Town and the 18.17 Llandudno Town - Manchester Victoria. A week later on July 13th the 20.26 Manchester Piccadilly - Chester diesel multiple unit ran into a herd of cows at Norley Road, Delamere. The leading car (M56261) was derailed, several cows were killed and some 240 feet of track damaged. 25150 was sent from Northwich to clear the railcars from the scene. A Chester crane was on scene to rerail the unit and remove the dead cows from the track. On February 4th 25150 & 25152 were noted westbound passing Wakefield Kirkgate with a freight train, most likely being one of the local tripper jobs returning empties to Healey Mills. On March 28th 25150 was noted at Settle Junction with a freight, which had been stopped due to a hot axlebox on one of the wagons. On June 2nd the 19.30 Crewe - Cardiff was worked by 25150, the next day (3rd) it was noted on the 17.10 Cardiff - Crewe. On July 25th 25150 & 25081 worked a roundtrip Leicester - Skegness. 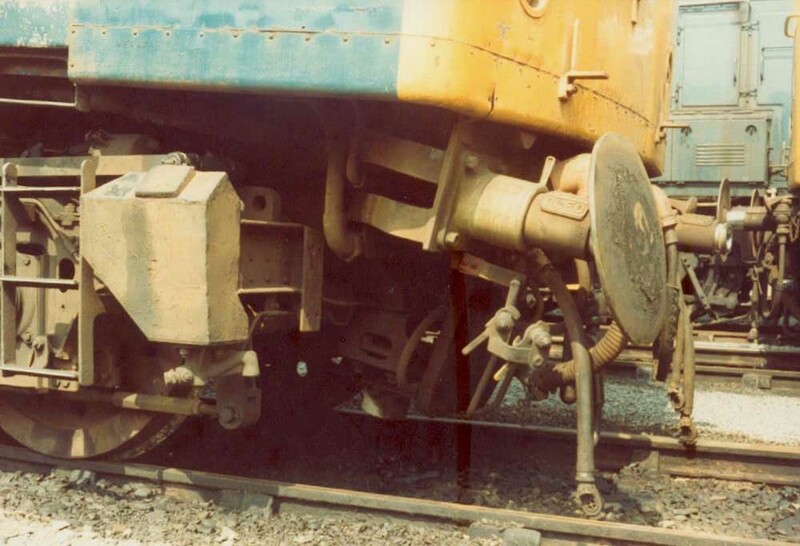 Condition July: blue/yellow livery, boiler room grilles sheeted over, hand/footholds plated over, straight sided sandboxes, three-rung bogie mounted footsteps, No.1 cab front - central lampbracket retained but the two fittings either side of the bracket removed (see Saltley view below), non-BIS side - scrape about one third the length of the body commencing behind the No.2 cab, about engine room window height. The 07.35 Nottingham - Llandudno Town was worked to Derby by 25150 & 25180 on August 1st, 25219 took the train forward. A week later on August 8th 25150 & 25167 worked the 10.10 Euston - Aberystwyth from Birmingham New Street and the 18.00 Aberystwyth - Wolverhampton. The first week of September proved quite hectic for 25150. On September 1st it replaced 25275 at Leicester on the 18.34 Norwich - Birmingham New Street. On September 2nd & 4th it workewd the 13.15 Birmingham New Street - Norwich and the 18.34 Norwich - Birmingham New Street. On September 6th 25150 worked the 18.37 Birmingham New Street - Norwich (possibly not throughout). 25150 was noted at Peterborough stabling point on September 11th. Photograph courtesy Jerry Glover 25150 at Saltley on September 6th 1981. The No.1 end reveals that the fixtures either side of the central lampbracket have been removed. The No.2 cab retained the normal arrangement. 25150 was stabled at Springs Branch on November 24th. 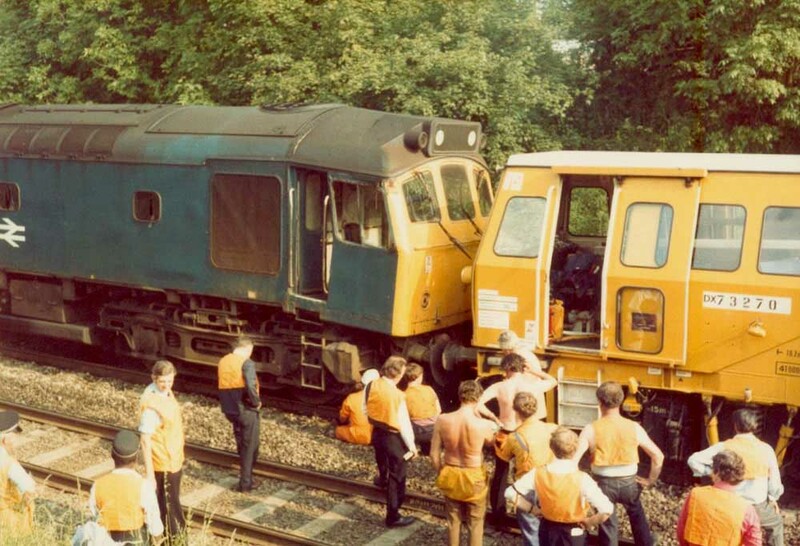 The end came for 25150 following a collision at Kilby Bridge on June 6th 1982. The locomotive was taken to Leicester depot and then forwarded to Derby Works on June 10th 1982. After evaluation it was withdrawn on June 13th 1982. It languished at Derby Works until February 1985. 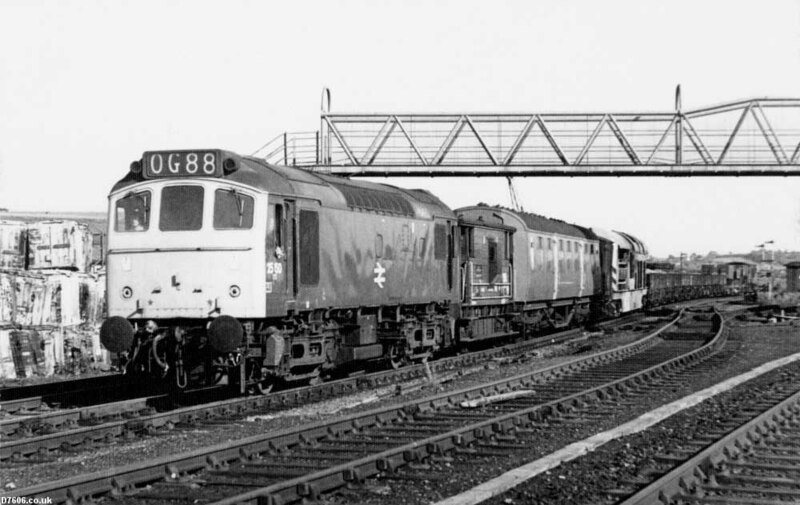 Derby had long ago ceased cutting up locomotives, so in order to trip the withdrawn locomotives to Swindon for breaking up, nine were prepared for movement during February 4th/th 1985. 25150 was included in this movement, comprised of 25036/049, 25150, 25228/253/277 25304/317/320. Photograph courtesy Victor Smith. 25150 at Kilby Bridge shortly after the collision with track machine DX73270. 25150 definately has come off the worst, although the track machine now has a bent frame. Photograph courtesy Victor Smith. Close up of 25150 at Kilby Bridge shortly after the collision with track machine DX73270. Photograph courtesy Victor Smith. A portrait of 25150 at Leicester Depot on June 6th 1982. In years gone by this damage would have soon been dealt with at Derby Locomotive Works. 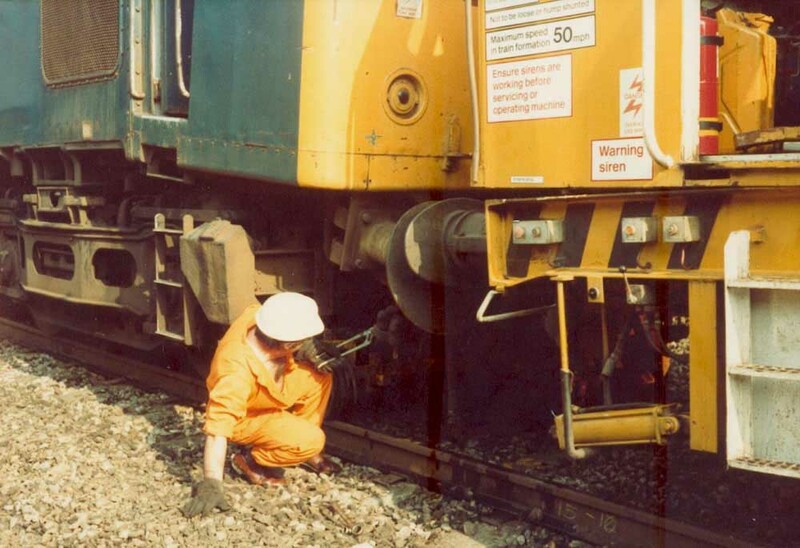 But now there are strict cost limits on any repairs to the Class 25s. For 25150 evaluation at Derby will lead to its withdrawal. No doubt the least that can be expected is that 25150 would surrender a variety of components to keep others of the class running. Photograph courtesy Victor Smith. 25150 after removal to Leicester depot. The Class 25s were reported as having weak frames, possibly these views confirm that statement. Photograph courtesy Victor Smith. A close up of 25150's No.1 cab after removal to Leicester depot.